Boating holidays are a wonderful way to spend the summer! Just pack your bags and float around on a houseboat or a yacht for a few weeks, enjoying the sunshine, fishing and swimming and visiting towns along the shoreline. It's comparable in cost to staying in a hotel, with so much less hassle. And it's great for the whole family, especially the kids. Children always find entertainment on and around water. They swim and snorkle, while adults relax in a fold-up chair with a cool drink and a book. Boating holidays, as opposed to travel on large cruise ships, offer a more intimate and relaxed voyage without the bustle of thousands of mega-ship passengers all around you. And the venues are more intriguing than the tourist traps visited by the big cruise ships. The smaller boats are surprisingly well-serviced, with features such as showers and sometimes bicycles for tours around the countryside during stops. Many online services throughout the world offer trips on local canals and lakes surrounded by historic locations. What about a canal trip throughout Holland? This seafaring nation was built on marshland, and vestiges of the marsh still remain in the form of canals criss-crossing the whole country connecting quaint towns (with architecture carefully preserved, thanks to Dutch laws against the remodeling of historic buildings) to cosmopolitan cities such as Amsterdam. England and Wales also have canals, are a multitude of tours are available, such as Llangollen, Four Counties and Cheshire Rings, Oxford and Avon canals, and the river Thames. 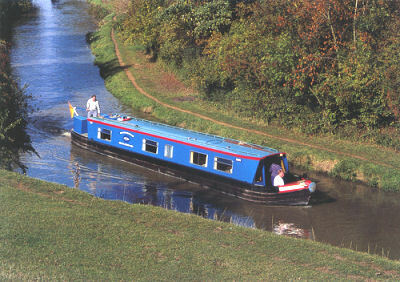 Unknown to most tourists, there is a network of waterways that traverse England from Yorkshire to Avon and into Wales. See different historic towns without battling holiday drivers on Europe's crowded roads (and believe me, if you are used to driving only on North America's wide freeways, European traffic will give you a shock). In Scotland, how about a boating holiday on 23-mile long Loch Ness? There's no guarantee Nessie will show up, but you are bound to be impressed by the rugged grandeur of the Great Glen and the battle-scarred castles surrounding it. It is one of Europe's most spellbinding locations, and a pleasant surprise to those under the impression that there is no wilderness left in Europe. Eagles, ospreys and other rare birds and even otters live in this pristine environment. Needless to say, opportunities for fishing abound. Visit the Loch Ness Center at Drumnadrochit to learn the in-depth history of the area. Don't forget to consider a romantic boating holiday on the waterways of France. The canals of Brittany, Burgundy, Alsace, River Charente, River Lot and the South of France offer beauty, culture, and inimitable French food and wine enroute. In North America, the Great Lakes region is so large it is impossible to see it all on one 2-week boating holiday. The St. Lawrence River is one of the most important rivers on the North American continent. It begins in the Great Lakes, leading to as vast estuary before ending in the Atlantic Ocean. It is approximately 500 miles long, and forms the border between Canada and the USA for approximately 100 miles. Sail up the St. Lawrence canal on a tour into French Canada for spectacular northern scenery and wildlife such as Beluga whales. While on the topic of North American boating holiday destinations, let's not forget Lake Tahoe. This is a perenially popular tourist destination, and every American who has the chance should visit this unique lake at least once. There are Emerald Bay sightseeing cruises on the Tahoe Queen, and rides on the M.S. Dixie II paddlewheeler. There is also a 44-foot trimaran and 55-foot catamaran. Small family boats are available for private family rental. Lake Tahoe offers many upscale resorts and restaurants as well as historic tours.